Hi, I am new. Have done skk and Bujinkan, and am currently studieing Shotokan. Have no sword making experience, but lots of knife sharpening over the years. Anyway, have always wanted, but never bought a katana, and currently think a ko-kat would be cool. 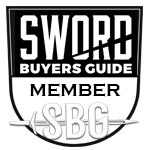 I would like to know if anyone has ave bought one of the sinoswords discounted blades, and cut it down on the blade side to a ko-Kat, and used the remainder to make a knife. Kinda simulating a broken blade. If you cut down a differently hardened blade on the blade size, you will have a soft (and badly shapen) kissaki. Having it shaped right by a pro will probably cost you more than a new sword, and the kissaki will still be soft. This might work better with a TH sword, but still shaping a proper kissaki is not a beginner's job. On the other hand might be a fun project, so this might be a way to go indeed. Why not order a new ko katana from Sino, or from Ronin for instance? You can get Ronin ko-katana new below $300. That is a price I could be ok with, not 300. And there are several ko-Kat out there that could meet my desire/design. Part of this is to have something I am at least in part responsible for its form in the end. And to have a ko-Kat with full length Saya and a matching tanto, or cool kinfe with weird profile that will have a story behind it. As to the tip. I know it won’t be authentic. I was thinking simple chisel point close to 45 degrees. I am planing on a blade length of around 18”. I know it would be important to get one that has a bo-hi only on the near part of the blade or none at all.